Home » News » Fire engine stucked in its 45-degree angle position. Fire engine stucked in its 45-degree angle position. Los Angeles - Fire engine sunk into a large hole caused by a broken water main in the San Fernando Valley early Tuesday morning. 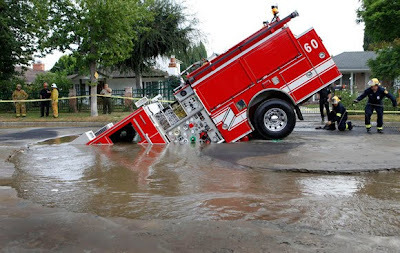 The Fire Engine 60 was sent in response to water main rupture and finally ended up as a victim itself. It was successfully pulled out of it later today. No Comment to " Fire engine stucked in its 45-degree angle position. "